Don't let your night of horrors become a real nightmare. These Halloween party ideas are so good they're scary! 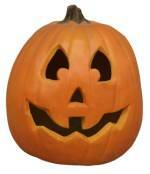 Everything you need to make your Halloween party a real spooktacular full of ghostly fun and ghoulish delights. We show you how to put together a witches brew of tricks and treats that will turn your party into the one they're all talking about. Halloween decorations are simple. Its easy to download various pictures and other bits and pieces from the internet. But its also great fun to make your own. A bit of imagination means you can squeeze a lot of juice out of a few basic ideas and enjoy yourself in the process. The colours of Halloween are dark green, black and orange. Balloons and streamers in Halloween shades start to set the scene. Carved pumpkins with candles inside (jack o' lanterns). Lots of small ones can be just as effective as a few big boys! Hang bats (plastic, rubber or home-made from card etc if you are"crafty") from your porch, ceilings, doorways. Make ancient gravestones from painted cardboard. Use bent wire coathangers and an old sheet to make life-size ghosts. String tiny fairy lights (white or orange) around your venue. Cut out black card silhouettes of witches, bats and black cats. String them up or have them on the walls. Keep lights dim and use candles where it is safe to do so. Well there's no shortage of ghoulish and scary horrors to dress up as. What's nice too is there are plenty of options for male and female and party people of all ages. Halloween characters are supposed to be outrageously over the top so go heavy on the face paint and scary outfits. The trick here is to give everything Halloween names. For instance cocktail sausages and ketchup become "Witches fingers dipped in blood"
Fried chicken wings become "Vampire wings"
Vol au vents or other tarts become "Zombie eye sockets"
These Halloween party ideas are guaranteed! Halloween Soul Cakes - The traditional reward for mischief makers.